Humans are biologically wired to learn how to speak. Reading, however is not learned instinctively. It must be taught. 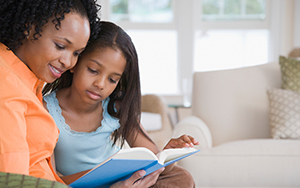 The earlier you begin, the greater your child’s chances are of becoming a fluent reader. It’s helpful for early elementary programs to continue with the pre-literacy activities that are often offered in preschool settings. Parents can reinforce the emerging skills at home by using games and other activities to keep it fun. Syllable Recognition: Clapping so kids can hear how many syllables a word contains. Words like bi-cy-cle and el-e-phant engage attention. Alliteration: Try Peter Piper picked a peck of pickled peppers with 3 or 4-year-olds, calling their attention to hearing the /p/ sound at the beginning of the word. Oral language comprehension: Ask your child to retell a story you have read, or to repeat a sentence. Using a puppet to demonstrate delights your kids. If your child has difficulty with words out of context or multiple meanings (confuses letter of the alphabet with a letter that is mailed), explain it. Background knowledge: Relate to real experiences. To understand a story about the zoo, it helps to have been there, or to have seen a zoo on TV. Oral language expression: Children that learn to talk late are at a disadvantage. Give them the chance to express themselves. Talking with a puppet may help. Vocabulary: Learning to read requires knowledge of vocabulary (recognizing what words mean) and verbal reasoning abilities. Ask your child to explain things such as why it gets cold at night. Print awareness: This includes recognizing that the words on the page—not the pictures—carry the message, and that words are read left to right and top to bottom. Letter recognition: To help kids identify letters with confidence, play with 3-D letters, watch Sesame Street together, look at alphabet books and notice familiar letters in signs and names, particularly the child’s own. Oral Language Expression: Watch a TV show with your child and discuss it afterwards. If applicable, ask your child to relate it to a life experience, predict what will happen in another episode, or comment about why one of the characters behaved in a certain way. Reading Fluency: Help overcome an aversion to reading with subject material that interests your child. If he loves cars, read articles together from Road and Track magazine. If Harry Potter is too difficult, read it to your child. Listening to popular audio books also encourages interest in reading. Written Expression: Many children with reading disabilities also struggle with writing. Have your child write a letter to a distant relative or friend, make a to-do list, keep a diary or journal. Encourage your child to learn how to keyboard, either by taking a class or at home with typing software. Margie Gillis, Ed.D., is the President of Literacy How, an organization that trains teachers to use research-based reading methods in the classroom.